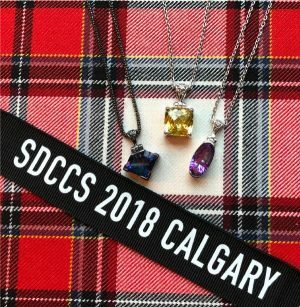 June 30- July 4, 2018, Calgary was host city to the largest Canadian competition for Scottish Highland Dance. This event attracted nearly 1000 dancers from all over Canada, United States, Scotland, Australia, and more! Kate King Jewellery was the proud sponsor for the Premiership that took place on July 3. We awarded 72 dancer specially designed pendants for the event. The Champion dancer for each age category received a Blue Topaz simulant, the first runner-up a corundum Yellow Sapphire and second runner-up Shasta Pink Sapphire. The fourth, fifth and sixth runners-up received Destiny (spirit), Indigo Warrior, Sunstar and Vitality Mystic Quartz pendants. Congratulations to all the dancers that participated over the five days. Your dedication and talent is an inspiration and evidence of all your hard work that got you there. These stones will work to support these talented and passionate dancers in their pursuit of Highland Dancing and life for years to come. The theme of the event was Elevate to Excellence. This fits perfectly with our mission to use gemstones to raise our vibration to accomplish our dreams and live in joy and excellence. When we live in our highest vibration, we collectively raise the vibration of all of humankind. This definitely is Elevation to Excellence!